Cypress, CA ? 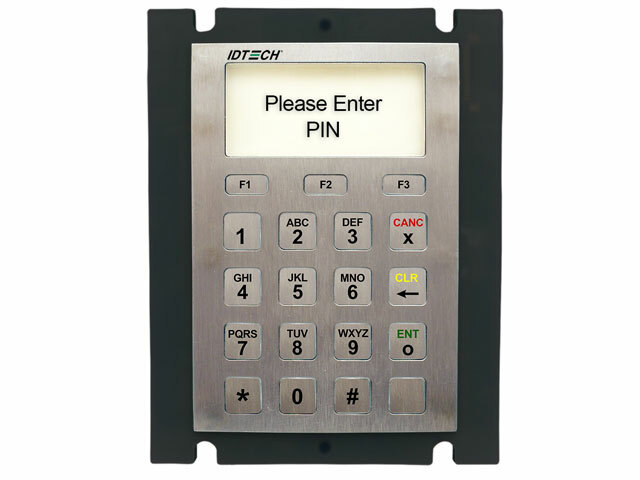 June 9, 2016 - ID TECH, a leading manufacturer of secure payment solutions, mobile payment, point of sale peripherals, and digital signage, has announced that the SmartPin L100? has been released to production. ID TECH?s SmartPin L100? is a PCI 4.x certified PIN Entry Device designed for outdoor unattended POS operations where encrypted PIN entry is required. The SmartPIN L100? supports TDES encryption algorithm using DUKPT and Master/Session key management. The SmartPIN L100? can be used in fuel dispensers, kiosks, vending machines, and other POS systems that accept credit and debit payments.. The SmartPIN L100? ?s robust, vandal resistant design features a molded body, a stainless steel cover, and metal engraved keys, allowing the PIN pad to be used in unattended environments. For further security, tamper switches and removal detection sensors protect the PIN pad from malicious activity. The SmartPIN L100? can also be used in outdoor environments with waterproof keys and a built-in gasket to withstand splashed, spilled, and direct liquid spray. When integrated with ID TECH?s Spectrum Pro, the SmartPIN L100 is an ideal product for a Chip and PIN Solution. The two products can also be paired with the contactless antenna from the ViVOpay Kiosk III to accept NFC contactless payments in outdoor and unattended applications such as parking, vending machines, kiosks, and other POS systems. ID TECH is a global leader in the Automatic ID industry with sales, manufacturing and R&D facilities around the world. The company has become a well-established payment solutions provider with extensive experience in data capturing and encryption products and services. Designing dependable, feature-rich products has made ID TECH a leading supplier of MagStripe readers/writers, mobile payment readers, contactless readers, smart card readers, barcode readers, POS keyboards, signature capture devices, PCI- compliant PIN pads, and other specialty products for OEMs, VARs, resellers, distributors, and key end users. ID TECH provides both standard and custom solutions to support customer requirements. For more information about ID TECH, please call 1-800- 984-1010 or visit www.idtechproducts.com.